The 46AC is a free-field microphone set and as such optimized for all acoustic applications, where the location of the main sound source is known and the microphone can be pointed directly at it ensuring 0° incidence. The high cut-off frequency makes it ideal for ultra-sonic diagnostics and impulse measurements, where minimum distortion and high resolution are obtained by the small size and fast response of the diaphragm. The GRAS 46AC is a high-performance 1/2” free-field standard microphone set for measuring medium sound pressure levels at high frequencies. In our clean-room environment the set is assembled and sealed with a label. However, the microphone set can be dismounted, if you wish to use the components separately. The microphone cartridge is the high-quality IEC 61094 WSF2 standardized GRAS 40AC 1/2" Externally Polarized Free-Field Microphone, designed for long-term reliability in multiple environments. The preamplifier is the GRAS 26TK Preamplifier which is a special version inclusive TEDS of the GRAS 26AK 1/2" Standard Preamplifier with 7-pin LEMO connector, and based on our well-known circuit board substrates. In the industry these are famous for their low self-noise, wide frequency and excellent slew rate performance. 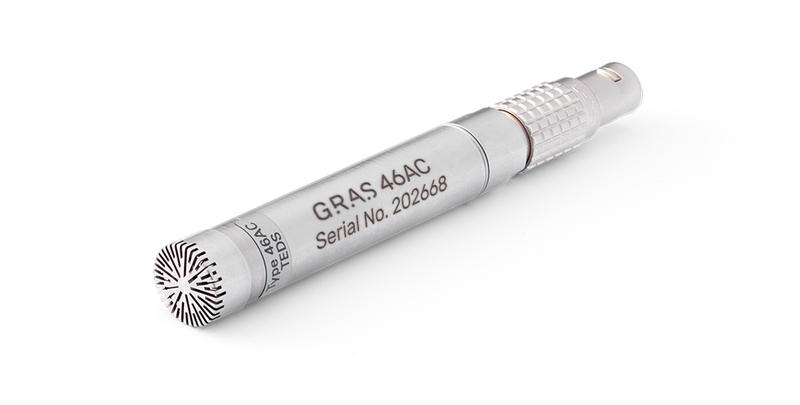 To perform as specified, the GRAS 46AC microphone set requires a power module or an analyzer input which can supply the preamplifier with power as well as 200 V polarization. If the power supply is lower, the capability of driving long cables is reduced and consequently the upper frequency is reduced. If the voltage supply is lower it will influence the upper dynamic range. The microphone set is terminated with a 7-pin LEMO connector. Cables with LEMO connectors of various types and lengths are available in standard as well as customized lengths. The 46AC is IEEE 1451.4 TEDS v. 1.0 compliant. If your measurement platform supports Transducer Electronic Data Sheets you will be able to read and write data like properties and calibration data.